The First, Second and Third Principals are roughly the equivalent of the Master and Wardens, although the importance is greater. They are considered to rule the Chapter as a triumvirate. There is no Chaplain in a Chapter, this function being performed by the Third Principal. The Scribe Ezra performs the same task as the Secretary of a Craft Lodge and ranks higher than the Treasurer. The Scribe Nehemiah might be best seen as a senior Inner Guard, although he again ranks above the Treasurer and will frequently progress to the Third Principal’s Chair. The Three Sojourners are roughly the Chapter equivalent of Deacons, responsible for the conduct of the Exaltation ceremonies. The Principal Sojourner has two Assistants, First and Second. The Scribes and the Sojourners wear white surplices. The Janitor performs the same function as the Tyler in a Craft Lodge.In many other respects, the offices are similar. 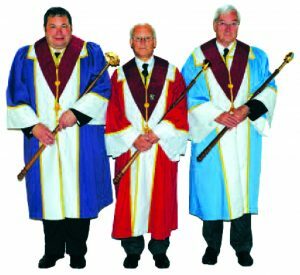 There is a Treasurer, DC, ADC and Assistant Scribe E who will have generally identical roles.The Chapter Almoner has a subtly different role, seeing if Companions are still enjoying their Chapter masonry, rather than the more pastoral role of the Craft Almoner. As in Craft Masonry, there are effectively three sets of kit, each consisting of an Apron, Sash and Breast Jewel. 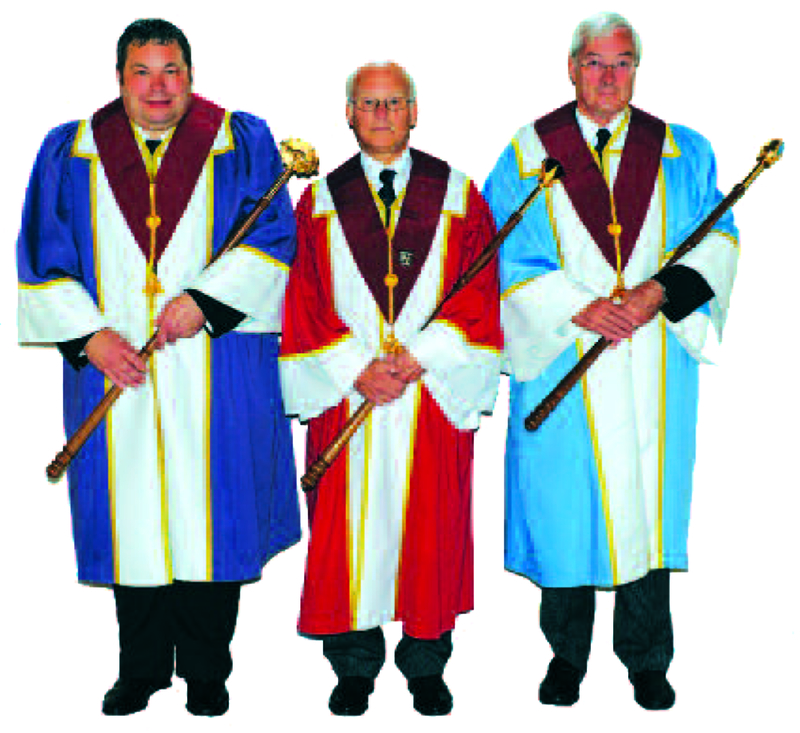 They roughly correspond to the Master Mason, Worshipful and Past Master and Provincial and Grand Officer. They can be differentiated by colour and is most obvious on the Jewel. On Exaltation, you will have noted that your Apron back, Apron tassels and Breast Jewel ribbon are white, although all Companions wear the same Jewel itself. You may not have noticed that a small portion of your Sash is also white. You would wear this for some years. When you are Installed as Third Principal, you become an Excellent Companion (rather like the Worshipful Master becoming a Worshipful Brother) and your kit changes in colour to red Breast Jewel ribbon, Apron back and tassels. On becoming a Past Zerubbabel, Companions are entitled to wear a Past First Principal’s Collar. On attaining Provincial Rank, the predominant colour changes to blue, with the emblem of your rank on your Apron, again as in Craft. The emblems are a little different so will again take time to learn to ‘read’. Also as in Craft, Provincial Officers wear a special Collar, this time of a tricolour design of light blue, red and dark blue, with a Collar Jewel appropriate to their rank. The Breast Jewel has a similar tricolour ribbon The Acting Provincial Officers have a larger outline to their Collar Jewel. These very senior Companions wear a larger Apron with a more ornate badge embroidered upon and larger Collar and Collar Jewel. Anyone wearing a Chain, as in Craft, is a Provincial Ruler and due considerable deference.